Teach Your Hamster New Tricks! Someone once said that you can train anything that has a brain that connects to a stomach, and that goes for hamsters as well. They are actually very clever little creatures and probably capable of more than you think – like learning tricks for example! 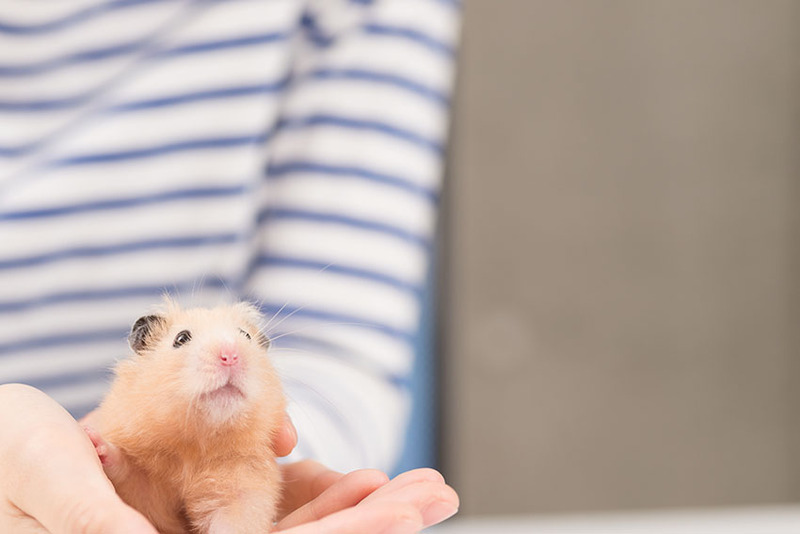 Training your hamster is a wonderful way to vary your daily playtime and spend time together, and it’s something that both stimulates your pet mentally and creates a strong bond between the two of you. It should be said though that this training takes a lot of time and patience, and every hamster is different, so there’s never a guarantee that your hamster will learn these specific tricks, or any tricks at all. As with most pets there are advantages of getting a young hamster when it comes to training and getting the hamster used to your and your family, as they have not yet developed habits and routines that can be difficult to break. This is not to say you can’t teach an old hamster new tricks, but it will take much longer to train him or her. The most important thing is that your hamster feels comfortable around you, and that your smell and your voice has a positive association. Try to always stay calm around your hamster, and avoid raising your voice, as that can cause unnecessary stress. Spend a good few weeks together with your hamster before you move on to tricks, so you know that you can trust each other! Now you need treats. Maybe you already know what your hamster’s favorite is, but if you don’t, we recommend sunflower seeds. They are however very fatty, so make sure that you limit the intake to training sessions or special occasions. You can also try with small pieces of chopped vegetables like carrots or broccoli. Start with an easy trick, a good first one is ”Stand”. Hold the treat in front of the hamster just over its head so that the hamster can see it but not reach it. As you do this, use your command ”Stand”. 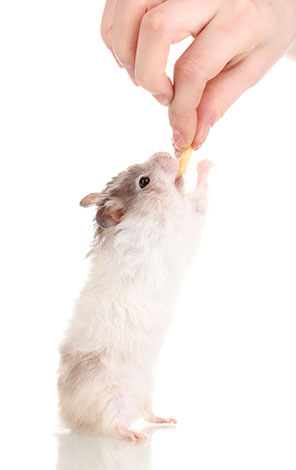 Your hamster will instinctively stand up to get closer to the treat.When the hamster stands, give the treat and verbal praise. Only give the treat if the hamster stands, as they otherwise won’t understand why they are being rewarded. If you hamster doesn’t stand it might be because he or she is not hungry at that moment, or distracted by something else going on in the room. Try again a bit later.Repeat this a few times a day for a week or two, until your hamster stands even when you don’t have a treat in your hand. Stick to one command at the time, and still always reward the hamster for standing. Now you can move on to another trick. Use the ”stand” command, and then move the treat up and forward and say ”jump”. If the hamster tries to jump, praise him or her and give the treat.If your hamster is happy to jump you can add a hoop into the mix. Hold some sort of hoop between the hamster and a treat, so that they have to move through the hoop to get to it. As they go though, say ”hoop” or ”jump through the hoop”. Start with the hoop touching the ground, and then gradually lift it if you hamster seems to enjoy the game. Another fun and easy trick is ”roll over”. All you need to do is to carefully place the seed on your hamster’s back and ask him or her to roll over. If they do it, reward with the seed. After a while the hamster will roll over even without you putting the seed on their back. Be consistent with the training, and let it take time, but it doesn’t hurt to shake up the routine every now and then to keep things interesting. Some tricks are easier than others, and all hamsters are different, so be patient and do not push your pet or get frustrated if it’s taking longer than you expected. If both you and your hamster enjoy the training, there is really no limit as to how much you can teach your pet. You can use toys or build obstacle courses; make up the tricks as you go along and show off to friends and family! Check out Omlet’s range of awesome Hamster houses! On average backyard chickens live to an age of six to eight years, but there are of course exceptions. How old a chicken will become depends amongst other things on the breed and how a chicken is kept. Heavy layers exhaust themselves with a lifespan of just three years, others can live up to ten years. According to the Guinness World Records world’s oldest chicken is Matilda, a Red Pyle hen from Alabama that died at the age of sixteen (1990-2006). A hen is considered a senior around the age of five. If you are not sure about the age of a chicken, there are signs that will tell you your hen is getting older. As a chicken gets older the texture of the comb will slightly change and she will likely have some scars from being pecked by other chickens. The feet and legs tend to thicken and if your hen has spurs, you know she’s not a youngster anymore (generally chickens grow spurs around three years of age). Arthritis may cause your older chicken to move stiffly and you might notice she walks a bit slower and more carefully. And of course the egg production of an older hen will decrease. The average chicken lays eggs for four to five years on a regular basis, with the peak of the egg production around 18-24 months. Already after two years, the egg production tends to drop. When you start seeing soft or thin-shelled and misshapen eggs, you know your hen is about to retire from egg laying altogether. But with most breeds living to age seven or beyond, you’ve got a few more years to enjoy the companionship of the hen that has served you and your family so well. 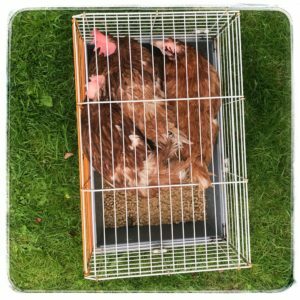 Caring for older hens isn’t difficult and really isn’t much different than caring for them when they’re younger but there are a few things you can do for them to make sure they are healthy and comfortable. Senior chickens can start having mobility problems due to arthritis or joint inflammation. By lowering the height of the perch to one or two feet of the ground its easier for your old hen to hop onto it, protecting her joint. 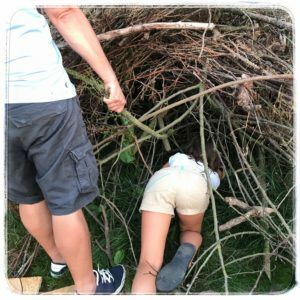 Building a ramp up into the coop might be necessary. Old chickens don’t move as fast as they used to. Providing them with a predator proof space is important to keep them safe. It’s best to supervise your chickens when they are free ranging. You may want to provide your older chickens with a separate coop and run to prevent younger, more aggressive hens from pecking them. Make sure food and water containers are easily accessible. This means the food and water containers must be on a easily accessible height. It can also be a good idea to have two sources of food and water: one in their run area and if they are free ranging one outside. Older chickens may not be able to range as far for food and water. If your entire flock is older and none of the hens is laying any longer, you can give the whole flock a chicken grower feed since they don’t need the additional calcium that a layer feed provides. If you are feeding different age groups together or ad new chicks to the flock, the entire flock can be fed the chicken grower feed from the time the new chickens are eight weeks old up until the laying age of 16 to 18 weeks old. After that the new layers will need a laying feed. The layer feed won’t hurt the older hens, as the calcium is good for their bones. Older chickens may not be wearing down their nails with activity like foraging and scratching. If the claws are curling round then they will need trimming. 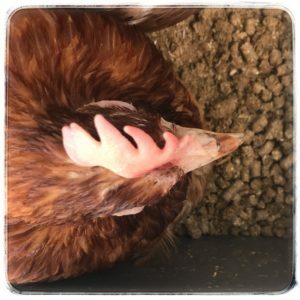 Consider nail clipping as part of caring for old chickens if your chickens have long nails. Try to find a vet near you who specialises in poultry. Do this and register in advance of having problems. Arthritis, egg failure, joint inflammation, gout, ascites, tumors, adenocarcinoma and salpingitis are issues that can come up with chickens of any age, but more so in old chickens. In their own way, older hens contribute well past their productive egg laying years. Older hens still produce manure, which is a great fertilizer for your garden. Older hens still like to eat bugs. You’ll notice a reduction in the number of ticks and snails in your garden when you keep a flock of chickens. Furthermore, older hens are more likely to go broody and be available to raise the chicks you purchase or hatch. Nathalie is the owner of the Instagram account My Backyard Paradise. Together with her husband and their three teenage daughters she runs her own ‘mini backyard farm’ in Belgium. The beautiful pictures she shares with her Instagram followers show that this truly is a backyard paradise. 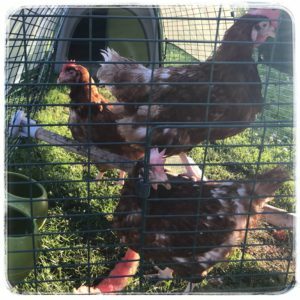 In June 2018 Nathalie decided to extend her mini farm with three ex-battery hens. Follow their journey to recovery in the two-part photo diary she kept for us. A laying hen, one that can lay up to 300 eggs a year, is what we were missing. During autumn, our purebred chickens don’t lay any eggs for a long time. They instead take spend their time and energy renewing their plumage and waiting for the days to get longer again. Last year we didn’t have any eggs for over 3 months despite having more than ten hens! We decided that if we wanted fresh eggs during autumn, we had to buy laying hens. We always buy our new chickens from a smaller trader or a hobby breeder, so we can actually see the chickens and know they have access to grass, clean water and decent housing. But we like the idea of rescuing a few laying hens destined for slaughter by giving them a good life in our garden. The life of battery hens ends after just sixteen months. Their bodies need time to recover and their egg production will stop. This means a loss for the industry. Besides that, after each moult the egg production will drop, and the industry does not accept that! So that’s what we did. First thing to do was find a place where you can rescue commercial laying hens from slaughter. 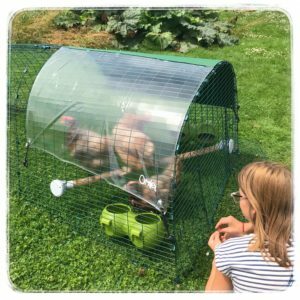 The first option we came across was www.redeenlegkip.be (‘Save a battery hen’), a Belgian website where you can buy or adopt a laying hen. If you decide to adopt a hen, you’ll pay a monthly contribution of €5 and get 24 egg per month in return. When you adopt or buy a chicken, the organization ensures the chickens are collected from the companies and given appropriate first aid. However, we wanted to experience this ourselves. After continuing my search, I came across another Belgian website www.lespoulesheureuses.org (recently also available in France). They give you the opportunity to collect the chickens yourself, so you’ll know the address and code (the one you can find on the egg) of the company. We then had to wait for the right weather. The best time to save a laying hen is when you can give her the ideal conditions to recover. They often don’t have many feathers left and have probably never been outside their barn, where the temperature is always at least 18 degrees! They’ve never seen rain and you should also be careful with draught and wind. You don’t want them to get ill, they have experienced more than enough stress already. When we get home, we inspect them carefully. They seem numb, or are they frozen with fear? They still have lots of feathers, but they are dull and not shiny like the feathers of a healthy chicken. Their feathers are tangled and the tail feathers don’t look good at all. Their gaze is blank and their comb is very pale. Their toenails are way too long and curly, and there is manure stuck under them. Clearly, they haven’t been able to scratch around that much. The beaks of our chickens have been trimmed. This means the top of the beak has been cut off when they were only ten days old. This is very painful and is done to prevent feather pecking. 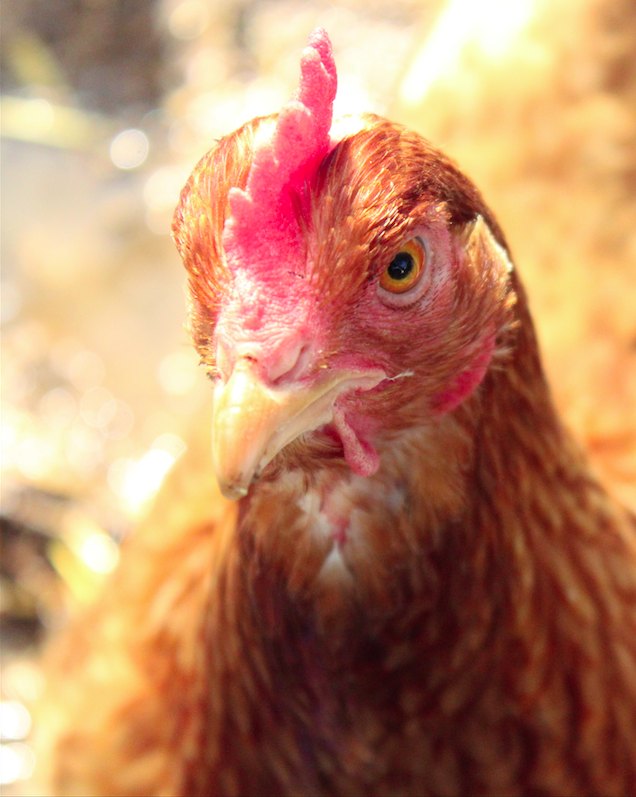 Chickens do this when they are stressed, for example due to limited foraging opportunities. It’s time to treat them against parasites such as lice and worms. We use Diatom Earth, a natural product used against all kinds of parasites. They need to be quarantined first. For this, we give them a temporary home in our Eglu Classic from Omlet. It has a 2 meter run and we can easily move it around in the garden so they have access to fresh grass every day. It’s also very easy to clean. We lift the chickens out of their cage and watch carefully how their feet touch the grass for the very first time. They seem surprised and for a few minutes they just stand still, until one hen realizes she can, and is allowed to, move. Slowly but surely, they cautiously start to explore their run. While the children are watching the chickens, I add the first dose of medication to their drinking water. We use Avimite, a product against lice and mites. The first week they need this on a daily basis, then weekly for the next five weeks. They soon find their water and it looks like they haven’t had any for days. Usually we don’t feed our chickens layers pellets so I had to buy them, because this is the only thing our new chickens have ever had. In the evening we help the chickens into their Eglu where they can safely spend the night. When I open the coop the next morning they don’t want to come out. After an hour we get them out of their coop and notice they have already laid three eggs, one in the nesting box and two on the roosting bars. Because of the medication, we cannot eat their eggs for the next few weeks. Sad, but we just don’t want to take any risk. We have to discard them. The rest of the day the chickens sit outside. They eat clover and grass for the first time and seem to realize this is not bad at all. The second and third night we have to help them into their Eglu, but from then on they finally realize that this is their new home. In the morning they come outside when I open the door and after a few days they only use the nest box to lay their eggs. Their eyes are getting brighter and they start to establish the pecking order. They are more lively than the first few days, but still nothing compared to our other chickens. Although they aren’t afraid anymore when we come near, they don’t allow us to touch them. This is hard for the children who want to cuddle them to make them forget their past. But the chickens first have to get used to their new environment, to us, and to their new life. We only have to repeat the red mite treatment once a week now and we can start with the deworming. This treatment, which they need five days in a row, can also be added to their drinking water. The hens give us two to three eggs every day. It’s now time to gradually change their diet. They are used to their new home, they’re not scared anymore when we come near or when our dog wants to sniff at them. They clearly defined their pecking order. We want the very best for our animals, and this also includes a rich and varied diet. Our chickens get Garvo but our 3 laying hens need something extra, a mineral and vitamin boost. We give them Alfamix, a very rich grain mixture with pellets and amphipods. But when I mix this with their layer pellets, I notice that they only eat their pellets and not the new food. 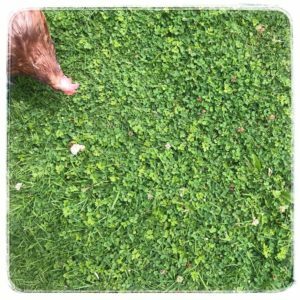 They do eat a lot of grass and clover. Slowly but surely their combs are getting redder. Come back in a couple of weeks time to read part two of the diary! If you’re a first time chicken keeper getting started this spring, you will likely be wondering what exactly you need to take care of your new pets. Some things will depend on your garden and how many chickens you will be getting, and others are a standard essential for all chicken keepers. We’ve put together this handy guide for everything you need, plus there is a checklist at the end for you to use when shopping. First things first – housing. Your choice here will mainly depend on the number of chickens you plan on getting. At Omlet, we recommend a plastic chicken coop to reduce the risk of red mite infestation and to keep your girls completely weather protected. The traditional wooden chicken coop may look nice but they are harder to maintain, keep waterproof and red mite free. 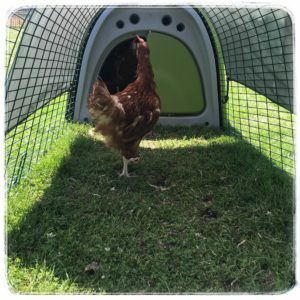 Our Eglu chicken coops not only look great (available in purple or green), but they are also completely weatherproof, twin-wall insulated, and super easy to clean, making it virtually impossible for red mites to survive. The Eglu Go and Go UP are a good starting point if you are only planning on getting 2 to 4 chickens. The house is the same, with a pull out droppings tray, nesting area, roosting bars and easy open back door, the only difference is that the Go UP comes on a stand with a ladder up to the coop, making the run taller, giving more space for hentertainment and allowing your chickens to roost off the ground. The Eglu Cube is our largest coop. It is suitable for up to 10 smaller bantam breeds such as Pekins, 6-8 medium sized hens like the Rhode Island Red or 4-5 large breeds like the majestic Cochin. The Cube also has a back door and pull out droppings tray, plus a side egg port for you to easily collect your eggs from the nest box (which is big enough for 3 chickens to lay at once). All our chicken keeping products, including the Eglus have 10% off now until the 22nd of March in our Spring Sale, so if you are thinking about keeping chickens now is the time to do it! The Eglus are available with a fox resistant chicken run made from strong steel weld mesh, impossible for predators to break. A unique anti-tunnel skirt sits flat on the ground and prevents animals from digging in. 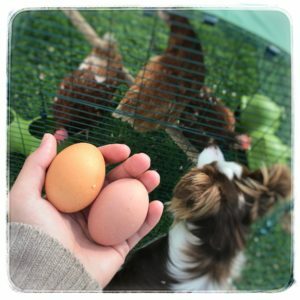 Choose your run length based on how many chickens you will be getting and how often you will be able to let your chickens free range. 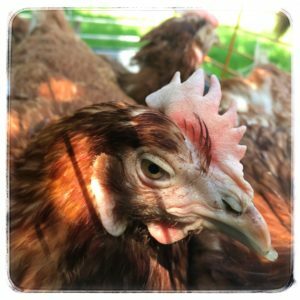 If you start with a smaller run to begin with and realise later on your chickens need more space, we have run extensions available, or you may want to consider a larger Walk in Run to give your chickens lots of space and make it easier for you to spend time with them and look after them. 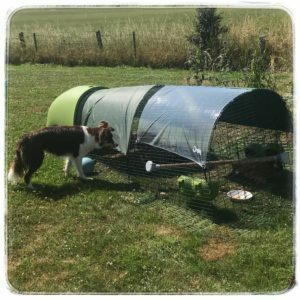 A number of accessories are also available for your Eglu run including wheels and run handles to make it quick and easy for one person to move the coop and run to another area of your garden. Something else you may want to consider for your garden set up is Chicken Fencing. Although, not predator proof, chicken fencing allows you to section off an area of your garden to keep your chickens in one place. This is especially useful if you have a larger garden that you don’t want your chickens to get lost in, or if you have a vegetable patch or flower bed to protect. This is best used when you are home or at a time when you know foxes are not about in your area, so you know your girls are safe free ranging outside of their coop run. Like any other animal, chickens can get bored and need good sources of, what we like to call, hentertainment to keep them occupied when you are not around. 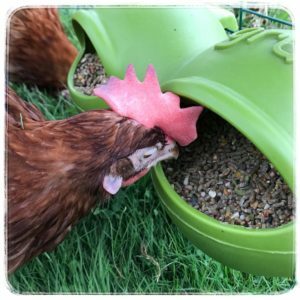 Our Rocky and Elvis Peck Toys slowly release treats over time while being pecked and offer hens great boredom busting fun. 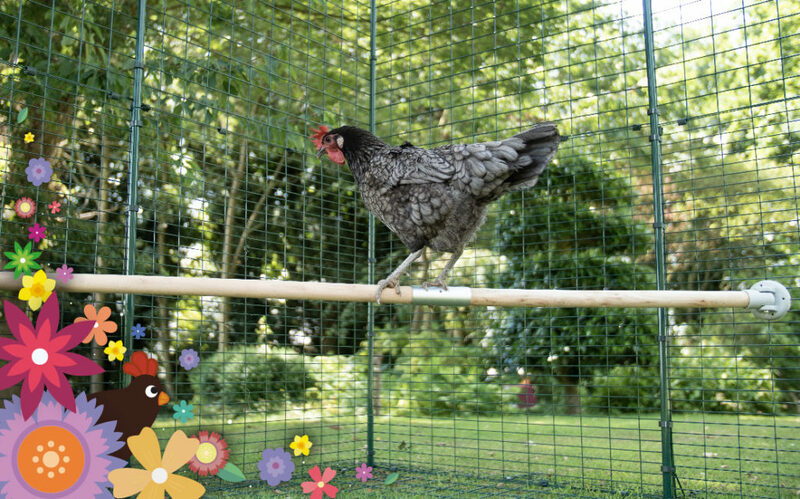 The Omlet Chicken Perch can be placed anywhere on any chicken run, and allows your hens to fulfill their natural desire to perch from the highest point available while in their run during the day. For spring and summer time you may want to consider a shade for the run to give your chickens a cooler area out of the sun where they can chill out. For winter, an Extreme Temperature Blanket is ideal for keeping the coop warm when temperatures drop below freezing for multiple days in a row. There are also a number of run covers and wind breaks available so your chickens can still enjoy time outside while being protected from the elements. For laying hens you will need to provide layers pellets which offer the protein content they need to stay healthy and regularly lay eggs. A fully grown chicken will typically eat about 120 grams of layers pellets a day. You will also need to provide grit which is essential for helping chickens digest their food, as they do not have teeth. Corn is a great treat for hens but should be limited as it is high in fat. Other treats, such as fruit, green veggies and cereals should also only be given in limited supply to avoid chickens filling up on those rather than the layers pellets. It also important to ensure fresh water is available at all times – checking and refilling it daily. 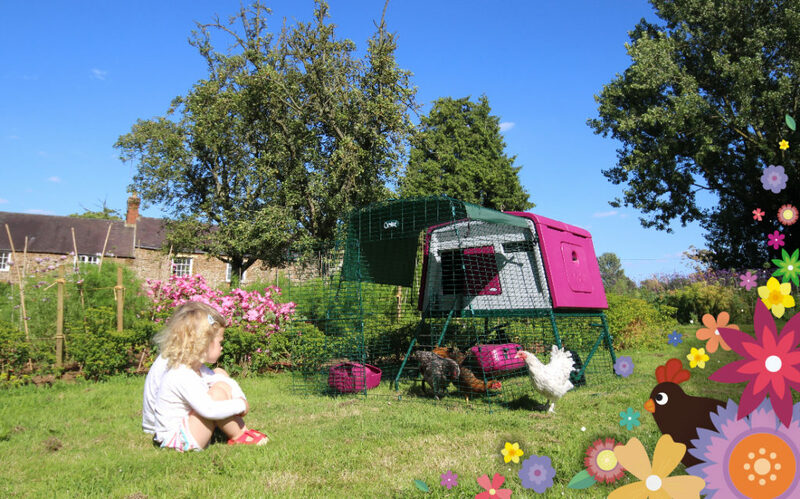 Our Eglus all come with a feeder and drinker but you may want to consider buying extra to offer another area in your garden for when they are free ranging, especially important for chickens who don’t like to share with their coop-mates! There are lots of different types of bedding available on the market, and which you choose is entirely dependent on your personal preference. Some to consider include dust extracted wood shavings, straw, chopped cardboard, Aubiose and Easichick. When you give your chickens’ droppings tray and bedding area its weekly clean, you might want to consider sprinkling some Diatom Powder around to prevent any bugs making a home in your chicken coop, and adding some BioDri to bedding will help to sanitise the litter, make it last longer, and reduce the growth of bacteria. Deep clean your whole coop once a year with a disinfectant such as Johnson’s Clean ‘n’ Safe to ensure the coop is spotless. Last but not least: Chickens! When you have everything in place and are ready to get some chickens, we strongly recommend looking to charities to rescue an ex-battery hen. 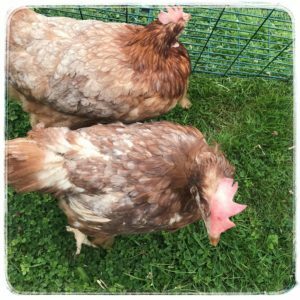 While these hens may be a little more wary of their new home and the strange environment they are not used to, they will soon come round and settle in and be a great layer for you and your family. Get 10% off all the products mentioned in this post until the 24th of March in our Spring Sale! No promo code needed. 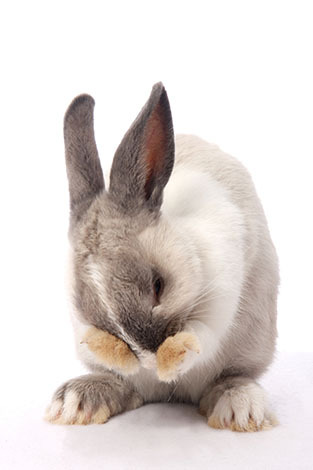 Lost of postures and vocalisations can mean several things depending on the situation, and can differ somewhat from rabbit to rabbit. It is therefore important to be able to take in accompanying signals that help you see what’s going on. 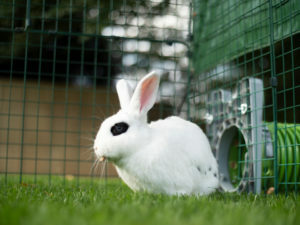 Territorial behaviour – If you have got a new hutch or run, the rabbit will have to make sure that its territory is marked. 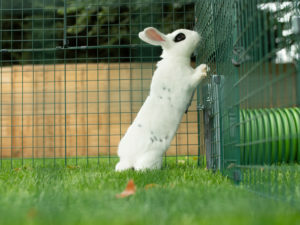 Rabbits do this by rubbing scent glands on their necks against objects, spraying urine and scattering their dropping around the place. This behaviour normally stops once the rabbit feels at home. The bunny flop – Rabbit is rolling on its back with the legs in the air. 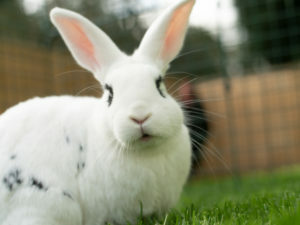 This is a sign that the rabbit is really happy and relaxed, and the movement can sometimes be combined with a binky, which means that the bunny is running around and dancing madly, often jumping up in the air out of pure happiness.